You Are Here: Home » Kurd news, Kurdistan, Women's rights » Call to Women for 9 January! Call to Women for 9 January! As is well known, the Middle East is undergoing a historical process. At this specific period when the Third World War begins, we are waging under women’s lead a tremendous struggle in the Middle East against all forms of exploitation, and against the outburst of male-dominant mentality, ISIS, particularly in the Kurdistan cities of Kobanê, Şengal, Minbic, Şırnak, Amed, Nusaybin, Gever, and Sûr. In anticipation of our reality today, in 2013 we have organized the 1st Middle East Women’s Conference in Amed with the participation of 250 women delegates across 26 countries from the Middle East, North Africa and the Arab World. Some notable decisions were taken at that conference. 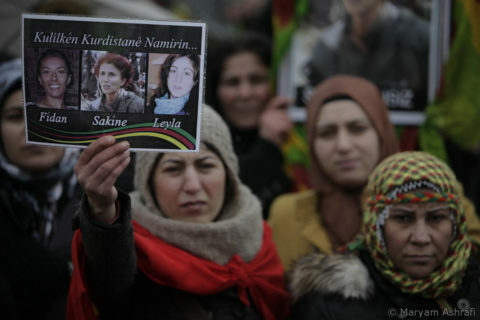 The delegates declared the day of January 9, in regard to the 2013 Paris massacre of the Kurdish woman politicians, Sakine Cansız, Fidan Doğan, and Leyla Şaylemez, as the ‘Day for Common Action against Political Murders of Women’, and devoted it to all women around the world who have paid prices or lost their lives in their respective political struggles. Following this massacre, on 4 January 2016, like repeating the plot of January 9, three women KJA (Free Women’s Congress) executive members, Sêvê Demir, Pakize Nayir and Fatma Uyar, were executed on the street by heavy weapons in Silopi. The Turkish State did not open any investigation into this massacre. Yet again, the only arrestee and the witness of the Paris massacre lawsuit, Ömer Güney, died in prison close to the 4th anniversary of the murder! All these events simply demonstrate that the states try to spoil the evidence of the killings of women. We will not allow that! We will continue calling perpetrators to account, by escalating our common actions and struggle against political murders of women on January 9, 2017. In this spirit, we kindly request from you the photographs and biographies of the women from your country who were murdered for political reasons, to enhance the solidarity across 9 January 2017 actions in the World, Kurdistan and Turkey. We also expect your individual or institutional solidarity messages in relation to the meaning of the day in the name of comrade Sakine.